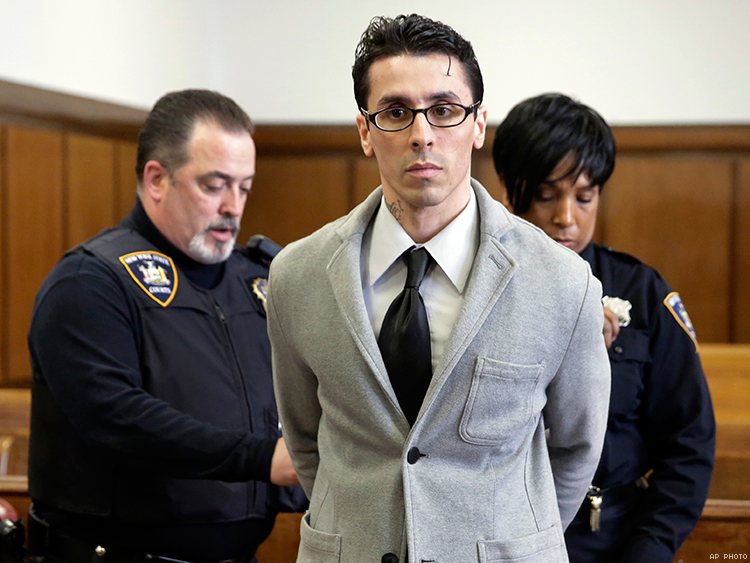 After two days of deliberation, a Manhattan jury today found Elliot Morales guilty of second-degree murder as a hate crime for the 2013 killing of gay Brooklyn resident Mark Carson, reports The New York Times. The charge carries a sentence of 20 years to life in prison, according to the Times. Morales shot Carson in the face in May 2013 in New York City's historically LGBT West Village, after allegedly calling Carson and his friend “gay wrestlers” and “faggots.” Carson's death marked the fifth violent attack on an openly gay man in Manhattan in just three weeks. After rejecting four court-appointed attorneys, Morales represented himself against eight charges, including murder as a hate crime and weapons possession, in New York State Supreme Court. The 36-year-old claimed that he had shot Carson in self-defense and also told the jury that he had no biases against LGBT people, saying he was bisexual himself because he previously had a sexual relationship with a transgender woman, whom he called as a witness on his behalf. Several witnesses — including Carson’s best friend, Danny Robinson, who was standing beside Carson when the 32-year-old was shot in the face — testified that Morales used antigay slurs toward the men before enticing them around a corner and shooting Carson, who was unarmed. Ryan Kendall, a witness who provided police a description of Morales moments after the shooting, tells The Advocate that today's conviction offers only a modicum of justice. Kendall, a student at Columbia University in May 2013, happened to turn a corner that evening and hear Morales call Carson and Robinson "faggots." As Morales fled on foot after the shooting, he threatened Kendall and warned him not to tell anyone what he'd seen. Kendall was a witness for the prosecution, and was cross-examined by Morales on the stand. "While this is some measure of justice, real justice would be fewer guns on the street, more social services for people released from prison, and economic opportunity," Kendall tells The Advocate. "Justice would be Mark Carson still alive. We, as a society, could have prevented this. We made these policy choices; we are culpable in Mark Carson's death, too." But prosecutor Shannon Lucey consistently argued that Morales's only motive for the murder was the presumed sexual orientation of his victim. It was an explosive moment. Mr. Carson, 32, was a Brooklyn native, outgoing and proudly open about his sexuality, who worked at gelato kiosk in Grand Central Terminal. Mr. Morales was from the Lower East Side of Manhattan, unemployed, broke and sleeping on a friend’s couch in Queens. He was armed with a .38-caliber revolver he said he wanted to sell. He had served 11 years in prison for a robbery during which three women were bound with duct tape, choked and assaulted with a pipe. Spewing anti-gay insults, Mr. Morales dared Mr. Carson and Mr. Robinson to come around the corner onto Eighth Street to settle their differences, Mr. Robinson testified. They followed him, thinking it was a bluff. There, just after midnight on May 18, 2013, in the shadow of a closed bookstore, Mr. Morales shot Mr. Carson while Mr. Robinson was on the telephone with the police, witnesses said.